On-site documentation of the work performed and conditions of the properties that you are providing snow and ice management services for can be very beneficial. By recording what has been done at each property that is receiving your services, you can save yourself from any confusion that may arise down the road about a particular snow event or about the work performed. In an age of ever present cell phones and smart technology, snow and ice management is not excluded from the arising benefits of this era. There are many tools and apps that you can utilize on your smart phone or tablet to help you run your business and more specifically, track your snow events. Whether you want an app that does it all, like Nor’Easter Storm Systems, or just a simple GPS tracking app, check out this blog article to learn about all the best mobile tools that can help you document snow and ice management events. Snow doesn’t operate on a nine to five basis, which means you and your crews don’t either. You should have your employees or crew leaders record when they arrived and departed a site. Simply writing it down is acceptable, but there are a few more options. Some companies opt for GPS tracking devices, computer software solutions, time stamped video or time stamped photographs. All of these solutions are acceptable ways to confirm your service to the property. Recording the conditions in your documentation consists of two different parts. You should record the conditions at the site upon arrival and any changes that occur while you are servicing the property. When recording the conditions upon your initial arrival you need to include the following: day and date of the event, snow depth, whether it is currently snowing, wind conditions and visible conditions of the sky. Document any changing weather conditions while you are on-site like if it starts or stops snowing or if it begins sleeting, etc. 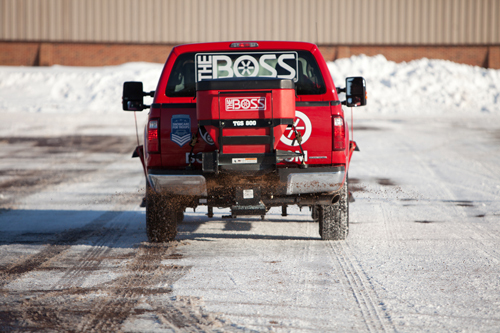 In the snow and ice removal industry, we all know it’s not as simple as just putting a snowplow to the ground. There are numerous services that can be provided in additional to snow plowing like de-icing, anti-icing, and snow disposal. You need to include which services were performed on the property you’re servicing and where on the property they were performed. This includes, equipment operating on the property and the employees or subcontractor operating it and crew or crews on the property. You also need to include any communication with the client on the property and indicate the name and title of the client and the information that was communicated. There are many factors, most of which are beyond company control, that could render a crew unable to perform all of the services they were contracted to perform. For example, performing service on a parking lot that is full of cars or full loading docks receiving deliveries. Parked cars and delivery trucks can make portions of a property inaccessible for snow and ice removal. In the event that you find areas that are inaccessible, this needs to be included in the documentation and communicated to the client. When the weather gets nasty, most people head inside, but not snow and ice removal professionals. You head out into the storm, and it can be hazardous. Because of this, sometimes accidents can happen. This usually involves property damage, vehicle accidents, or employee injury. You should have a policy on how to handle these events, should they happen. If any of these events do happen, you need to document it immediately and follow company policy. Documenting what happens at each property during service is a critical and beneficial process for any snow removal company. Use this information as a guide when creating or reviewing your in-event documentation process.